Before starting tasks, you may want to estimate how long tasks will take. Then as you work on tasks, you may want to know how long each task takes to complete. To set the estimated time you think it will take to complete a task, select your estimate from the estimate dropdown. (You can change your estimates on the Estimates Settings page).  Once you’ve made your estimate, this is the time that your work hours will be compared to. 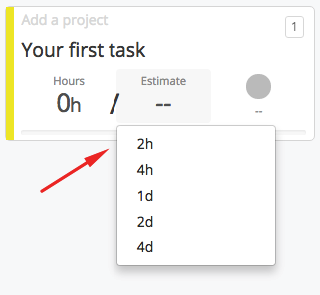 As you work on a task, add hours by clicking on the “+” button under the time worked dropdown. 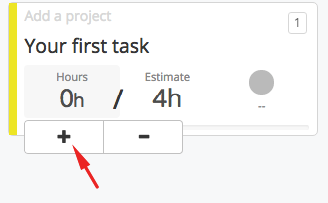 Tip: to add many hours quick, click and hold on the “+” button. 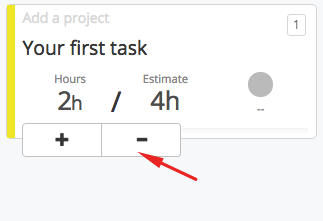 If you accidentally add too many hours, click the “-” button. As you add hours, you will see the progress bar update, tracking your progress.